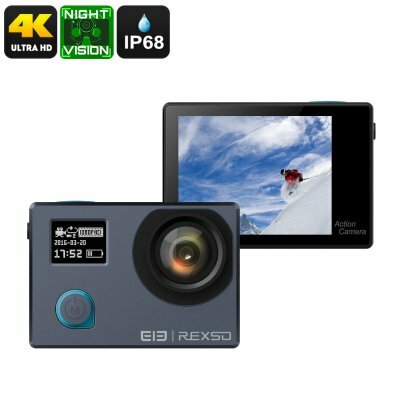 Successfully Added Elephone REXSO Explorer 4K Action Camera - IP68, Night Vision, Sony IMAX Sensor, Dual-Display, 4K, 16MP Picture (Grey) to your Shopping Cart. The Elephone REXSO Explorer is an ultra-slim 4K action camera that lets you shoot stunning pictures and video of your upcoming holidays and outdoor adventures. Along with the camera come an abundance of clips and hooks that allow you to attach your sports action camera conveniently to your gear. It furthermore has an IP68 rated waterproof case. This case resists water, dust, and shocks – allowing you to carry along your action camera anywhere you go. Whether you’re into scuba diving, mountain climbing, or base jumping – the Elephone REXSO Explorer action camera will always be at your side. With its Sony IMAX 179 sensor and 6 glass lens, this 4K sports action camera produces crisp footage at all times. It furthermore features the Mediatek 96660 chipset that, along with the sensor, makes it possible to shoot stunning 4K video and breathtaking 16MP pictures. With a viewing angle of 170-degrees, this sports action camera is sure to capture all that lies ahead. It comes with different shooting modes, guaranteeing that it will meet your filming demands no matter the occasion. With its 1050mAh battery, it lets you record for one hour straight. A unique feature this 4K action camera supports its Starlight night vision. Thanks to this, you’ll be able to shoot clear and crisp images even after dark. With WiFi and App support for both iOS and Android phones, you can instantly share recordings onto your smartphone. Additionally, your camera comes with a 64GB SD card slot that offers instant storage opportunities. With its Dual-Displays, you’ll be treated to high convenience while filming all your upcoming adventures and events. The Elephone REXSO Explorer comes with a 12 months warranty, brought to you by the leader in electronic devices as well as wholesale sport action cameras..